Picture this: you're in the midst of potty-training and your toddler is "a big girl" who doesn't need to wear diapers to bed. You insist reassuringly that she wear her diaper just for bedtime and that she'll be back to her underwear in the morning. Then, in the middle of the night you hear soft crying. Aforementioned toddler is sitting, in the pitch black, on the potty with her pants pulled down and diaper on the floor. She did good, she got out of bed to pee but got scared because after she peed she was stuck, in the dark, on the potty. Time for a night light? How about a light in the toilet? Ya, that's a thing (who knew?!). Prior to being approached by IllumiBowl, I was in the dark that something like this even existed (wah wah... HA! Oh come on! I love me a corny joke as much as the next person. Don't pretend you didn't giggle). Let me tell you, with potty-training happening over here, the timing couldn't have been more perfect for me to review this neat little gadget (although, I'm sure my up-3-times-a-night-to-pee-self could have easily used the product - and I may or may not have tested it out in our bathroom as well, you know to be sure). What am I talking about (I ask myself this question regularly)? 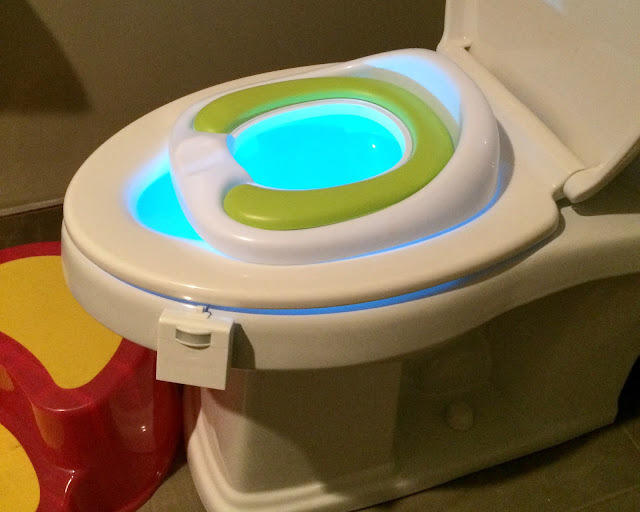 IllumiBowl is a motion-activated toilet light. It has suction cups that help it stick to the side and inside of your toilet bowl. 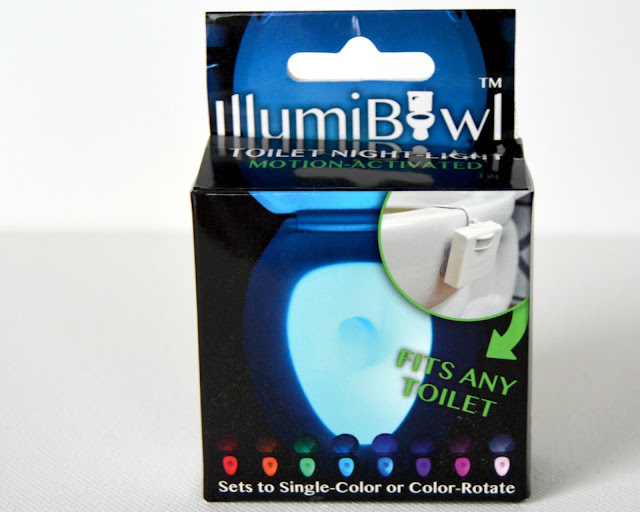 When there is movement in a dark bathroom, IllumiBowl lights up. There are two settings, you can have it change colors or you stop it on the color of your choice. The IllumiBowl is very easy to set-up. Literally add batteries (AAA) and stick it to the toilet and you're good to go. That's IT. It's definitely noticeable on the toilet, but that doesn't bother me too much. 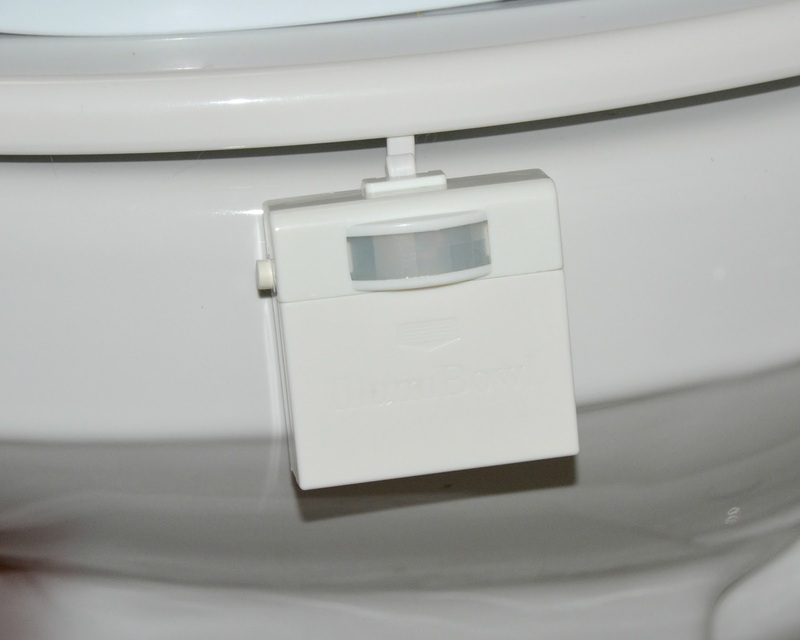 You have to have it on the side of the toilet you see or the motion sensor won't work (obviously). 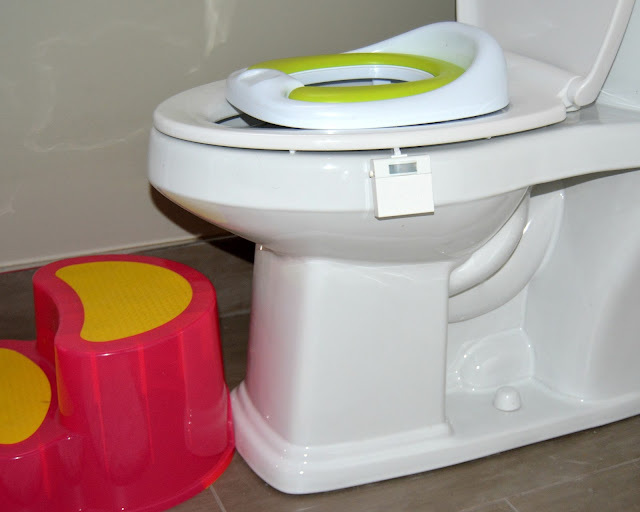 Yes, we're rocking a stylish hot pink and yellow step stool along with a white and green toilet seat. There's also a sticker chart in the mix, in case you were wondering. This really is the neatest thing. You walk into the bathroom and it turns on. Not only is it practical given our little who kinda needs to see where she's sitting (and can't reach the light switch) but it was also a great motivator for her. She thought it was the coolest thing that she had a special light for going to the potty in the middle of the night. Although, if I'm being honest, the first night we introduced it she had like 4 false alarms because she kept wanting to see the colorful lights. Cute but kind of annoying. We kiboshed that quick. Back on track. It doesn't need to be completely dark for the motion-sensor to turn on which I was worried about. We also keep a night light in the bathroom so mini-me can see her way into the bathroom and the IllumiBowl adds more light when she walks into the bathroom. All-in-all I really like this product and it remains on the toilet in the kid's bathroom and will stay there until they're old enough to reach the light switch! BONUS: Problems with your son/brother/hubby missing the target in the middle of the night? Problem-solved!! BAM! You are welcome.